Larter & Sons Art Nouveau cufflink, circa 1900. Larter & Sons created cufflinks and other gentleman's jewelry during the late 19th century and through much of the 20th century. They were a prolific maker. Their output ranged from fine gold and gem-set cufflinks to less expensive, but well made, links and dress sets crafted in base metal. As with their equally prolific competitor Krementz & Co., the longevity of Larter & Sons was in large part attributable to the firm's prescience in adapting to changing fashion and economic conditions. The brief efflorescence of the Art Nouveau style in the early 1900s was one such fashion change. Although Larter & Sons was not a major proponent of the new style, the firm created a small, but noteworthy, collection of bean-back cufflinks in the Art Nouveau taste. These cufflinks are admired for their richly detailed, graphic quality and subtle, somewhat restrained use of the Art Nouveau idiom. The leonine cufflinks pictured at the top of this post are a wonderful example with whiplash curves and tight scrolls flowing through the jungle vines and lion's tail. Below are several more of the Art Nouveau cufflinks created by Larter & Sons. Larter "Flowing Grape Vine" cufflinks, circa 1900. Nature was an important source of inspiration for Art Nouveau designers. Grape vines with their sinuous, entwining tendrils and large, lobed leaves were a natural (bad pun intended) theme. Note the manner in which the grape vine forms the border of the cufflink. Decorated, flowing borders that are an integral part of the overall design are characteristic of the Art Nouveau cufflinks created by Larter, Krementz and other makers. Larter "Good Luck" cufflinks, circa 1900. This final Larter cufflink abounds with symbols of good fortune - a jumbled mélange of a horseshoe, wishbone and four-leaf-clover. The twisting stem of the clover flows organically into the curving border. The wishbone is partially hidden by the horseshoe and almost disappears where it meets the scrolling border. 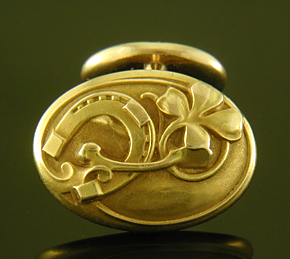 One of the delights of Larter Art Nouveau cufflinks is that they are richly detailed. Each time you closely examine one, you see something that you missed before. Recent additions to the Antique Cufflink Gallery include a striking pair of carnelian cufflinks by Wm. Huger, dramatic Art Deco cufflinks with diamonds and Greek key borders, foggy white chalcedony cufflinks from Sansbury & Nellis and, just in time for St. Patrick's Day, lucky cuff buttons with horseshoes, wish bones and four-leaf clovers. In the Antique Stickpin Gallery recent additions include a bemused monkey contemplating a pearl.